Ahhh, chocolate and orange, what a pair! They really are a match made in heaven. At Nopa in San Francisco, they serve a decadent chocolate mousse with bits of candied kumquats. As if that weren't enough, it's topped with a praline cream resulting in a dessert that is quite amazing and completely unforgettable. Being that I'm somewhat obsessed with kumquats, and chocolate for that matter, this was one dessert I knew I had to recreate at home.If making candied kumquats seems like a daunting task, believe me it's not. Mix sugar and water in a saucepan and you're almost done. The recipe makes more than you'll need for the mousse, so they'll be leftovers to use in drinks, serve with ice-cream, or just eat as is. Bring the water and sugar to a boil in a saucepan. Add kumquats and continue simmering for about 10 minutes, or until tender. 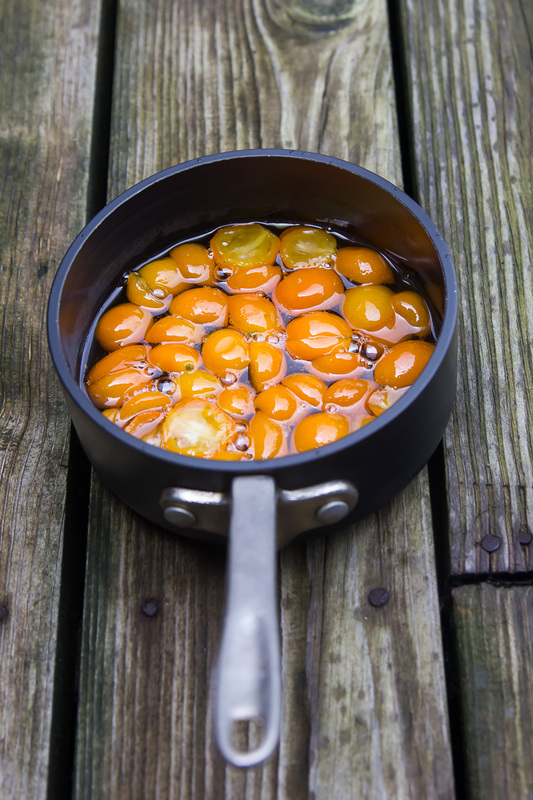 Using a slotted spoon, remove the kumquats to a heatproof bowl. Bring syrup to a boil and continue to cook until the liquid has reduced to about 3/4 cup. 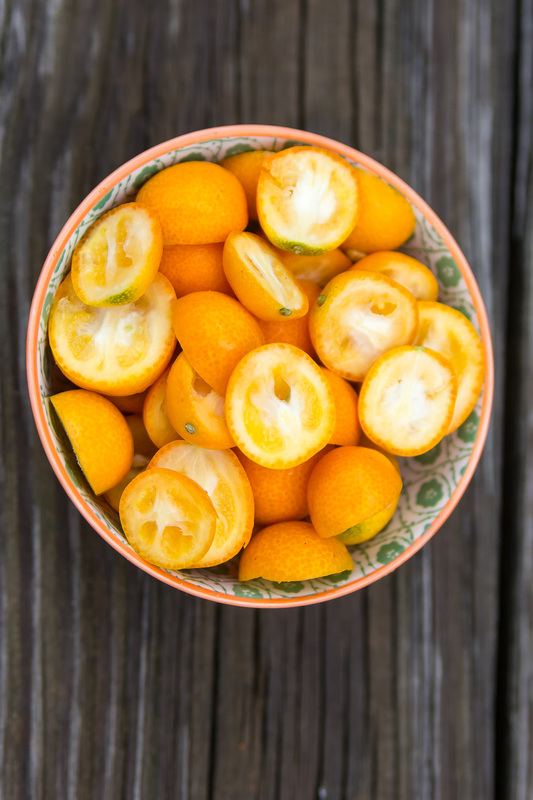 Pour over kumquats and cool completely before using in the mousse. Remove 2/3 cups kumquats from the syrup. Allow to dry slightly, then cut into strips. Reserve 4 kumquat halves from syrup for garnish. Add 1 inch of water to the bottom of a double boiler and bring to a boil. In the top of the double boiler, whisk the egg yolks with the sugar and salt. Set the pan over, not in, the simmering water and continue whisking until warm to the touch, about 2 minutes. Transfer to the bowl of a stand mixer fitted with a whisk attachment. Melt the chocolate on top of a double boiler. Beat the egg yolk mixture until it is pale yellow and thick, about 3 minutes. Remove and add the warm melted chocolate and whisk by hand. Add the egg whites and continue whisking until smooth. Using a rubber spatula, scrape the chocolate mixture back into the bowl in which you melted the chocolate. Stir in the chopped kumquats and set aside. Pour 1 cup cream into the bowl and beat with the whisk attachment until medium peaks form. Fold gently into the chocolate mixture until there are no visible streaks of white. Spoon into 4 individual serving bowls, or one large bowl. In a stand mixer, beat 1 cup cream with the kumquat syrup and confectioners sugar until stiff peaks form. 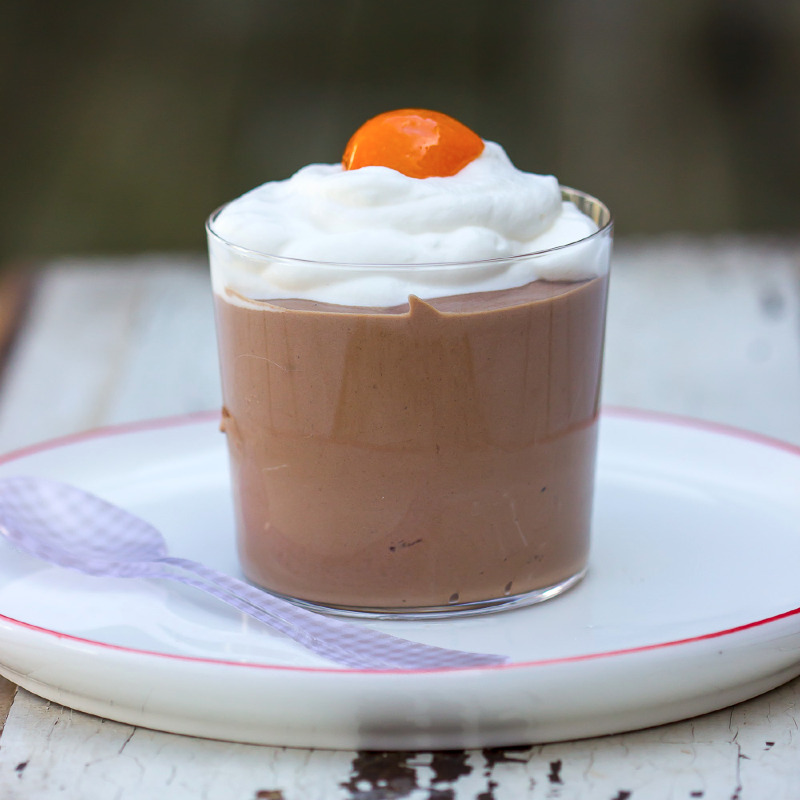 Top the mousse with the cream and garnish the top with the reserved kumquat.